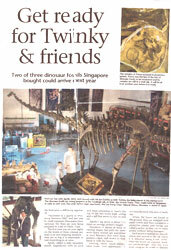 Lee Kong Chian Natural History Museum – Signapore | Maxilla & Mandible, Ltd.
We are pleased to announce that the Lee Kong Chian Natural History Museum has purchased our Dana Quarry sauropod family and will be exhibiting them upon their reopening in 2014. The Dana Quarry sauropods are the largest, most complete skeletons of their kind. Other mounted skeletons exhibited in museums around the world are much less complete—normally composites of different individuals. In contrast, all the Dana sauropods are over 80% complete, professionally prepared, and fully mounted. Despite the popularity of these giant dinosaurs, they are some of the most poorly understood. Scientists to this day have little knowledge of how they grew so large, how they moved, and how they evolved. 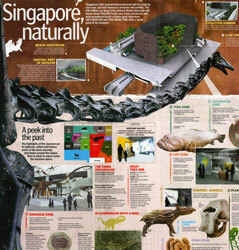 The Lee Kong Chian Natural History Museum will not only be able to display them for their visitors, but will also study them, furthering our understanding of these majestic creatures. 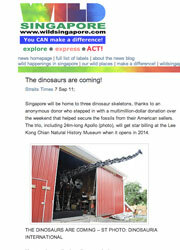 Check back often—we’ll keep an updated log of the Dana Quarry sauropod family’s press coverage, their journey to Singapore, and their installation into the Lee Kong Chian Natural History Museum’s exhibit. We can’t wait for their new home to be constructed and see and hear more about them in 2014!